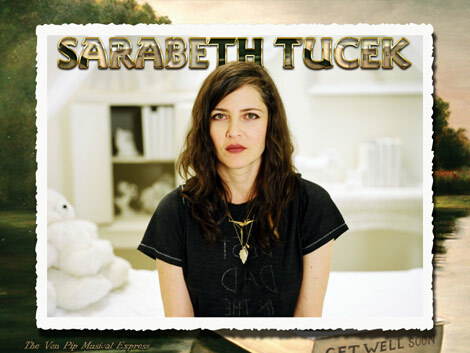 Sarabeth’s vocals seem somehow stronger and less fragile than on her debut album. Almost as if grief has liberated her as artist, enabling her to perform with a raw emotional intensity that is both spine-tingling and incredibly moving. In fact if this album doesn’t move you then I’d suggest a chest X-Ray is booked forthwith to establish if you actually possess a heart. The album’s track listing runs in sequence to reveal a story of loss starting off with the stark, and ethereal ‘The Wound and the Bow’ based on the legend of Philocetes , who like the bereaved suffers from a wound that will not heal. ‘Wooden’ starts off slowly, but bursts into to life with a searing guitar solo that wouldn’t be out of place on a Black Rebel Motorcycle album. It’s an album that works perfectly as a cohesive whole, ‘the Fireman’ is musically and lyrically perfect ‘I watched as you crossed the room to stand by the light of the moon/ and you said ….I will always be your father and you will always be my daughter’ and the regret and sadness in the chorus – ‘The fireman saved many a home but the fireman could not save his own’ is almost tangible. ‘At The Bar’ showcases Tucek’s pitch perfect voice, world weary yet not without hope –‘ you are such a child who ever told you/ beautiful things don’t die.’’ ‘Exit Ghost’ which references the ghost of Hamlet’s father is a sweeping, cinematic epic and the album climax and a resolution of sorts, the title track ‘Get Well Soon’ see’s Sarabeth looking back realising her mind, ‘was cracked’ and acts a reminder of the pain she experienced and also to look after herself, to keep herself well. This is the song that I’ve previously described as sounding like ‘an ascension to heaven whilst painting the sky with stars’ and ‘ as having the power to effect you so profoundly that it makes your heart ache whilst simultaneously gives cause for your ears to quiver with joy ‘and within the context of the album, it is even more powerful. It’s an intensely personal, emotionally cathartic song and is the perfect conclusion to a faultless album on which Sarabeth demonstrates that music still has the power to move and inspire, that it matters, despite what the pop charts may tell you. Anybody who has experienced the pain of loss, whether it be the end of a relationship or a bereavement will surely relate to the heartfelt emotions expressed in this magnificent album. A touching testament to the strength of the human spirit, from a singer blessed with a luminous, crystalline voice who has an innate ability to deftly convey the contents of her heart with an eloquent, understated majesty. I’m sure her dad would have been incredibly proud. A triumph! We had a chat to Sarabeth to discuss the album , her upbringing and kissing Bob Dylan ! VP: Hi Sarabeth, congratulations on the new album, it’s wonderful. The title track ‘Get Well Soon’ is one of the most beautiful things I’ve heard and really did stop me in my tracks However, it is rooted in genuine grief, indeed the album has been described as a kind of narrative about your father’s death and your subsequent reaction to it. Was it difficult to put such raw feelings into words and music? SARABETH: Oh sure. It’s hard for me to sit still with thoughts about my Dad. At the same time, I want so much to be with him so writing for him/to him is comforting. I think writing songs is always difficult because the feelings that prompt the writing are usually hard and jagged. I try to find solutions to the problems in my life through songs, in listening to others and my own. It’s like taking a rough shard of glass and letting it pass through fire, when it comes out the other end, it’s hopefully softer and more manageable. I think playing this set of songs in front of people will be more difficult than usual because of the subject matter but, you know, if find a lot things difficult, except eating, easy! VP: I was talking to Nat at Sonic Cathedral records about the title track and the lyrics in particular. Is the reference to ‘the gardener’ a metaphor for God (or death) or do you prefer to let the listener draw their own conclusions from your lyrics? SARABETH: Well, yeah, let’s leave that to the reader but there isn’t a whole lotta metaphor in that song. SARABETH: I want to play Liverpool!! I will be over in the UK almost all of May. I am very excited and yes, I love England. If i could, I would live there. I have always felt a sense of place there, I think musicians from here hold the UK in high esteem; it is where we want to play. I love how rich the history is and there is a ghostly dimension because of how old the country is. It also has heaviness and a bit of darkness that is comforting to me. I feel like the UK is better with subtlety and nuance, the U.S. can be very over the top, being somewhat withdrawn, I’m sure you can decipher which might be more my cuppa tea. VP: When you recorded the first album you said ‘Wouldn’t it be great to go back and sing those songs not worrying about the recording of it and kinda let go!” Were you able to do that with the recording of ‘Get Well Soon’. SARABETH: I think I did, I made sure that the emotion was of primary interest, I didn’t really care about much else, but recording is always stressful because you are in a sense saying farewell to the song, sending it adrift. In addition, you are faced with so many choices in a studio that it can be overwhelming to decide how to go. VP: Do you think, as the daughter of a psychiatrist and psychologist this has given you particular insights and a degree of introspection that has helped you as an artist? SARABETH: Well, I will say that my mother has to understand everything in a very deep way, you know, nothing is ever simply what it is. So, maybe, certainly knowing how to be alone and honing ones critical thinking skills were important in the house. I think if you learn how to be alone and be still, introspection follows. My father taught me how to listen to music which helped, it was boring at the time but I can see now it was a good lesson. He would put on piece of music and we were not allowed to speak, he wanted us to understand that music was an activity that should be the primary focus, you should be fully engaged. VP: You originally intended a career in acting; did you get as far as auditioning for roles and performing? What was the major turning point that made you take up music? SARABETH: I did, yes, both. I learned to make music so I wouldn’t be so lonely. When I first started playing it was after a big and painful break up and it helped me, kept me company. Whereas i used to run from my house to someone else’s I found myself running home to be near my guitar. It was a nice turn of events. I wish I had started earlier. VP: Do you still keep in touch with Anton Newcombe of the Brian Jonestown Massacre as he is oft described as very supportive of your musical career? SARABETH: No. His support mutated into something vicious and selfish. That’s kinda the way it goes with him. VP: These days it sometimes feel teenagers seem more focused on the acquisition of music rather than actually listening to and experiencing it. As a teen yourself was music very important to you and which bands would you say were a massive influence on you growing up? SARABETH: Music was very important; it was a bonding experience in the family. I think my father missed his calling in life, he should have been a conductor or a singer. He loved classical music and more avant garde stuff, he gave me Steve Reich, Philip Glass, and took me to see Laurie Anderson when I was really young. My mother liked the classic stuff, lots of Cat Stevens and Dylan. So much has influenced me, I don’t know, as a teenager I listened to everyone from Marvin Gaye to the Gun Club. I think Led Zeppelin influenced me a lot, the structure; the songs switch gear from soft to loud, which I really like. Also, Big Star, those lyrics still give me goose bumps. Neil Young, artists who could rock but also break your heart were my faves. VP: You’ve collaborated with quite a few high-profile bands in the past, (Black Rebel Motorcycle Club, Brian Jonestown Massacre) are there any artists you’d love to work with? Or really do you prefer working alone? SARABETH: Really, the one I wanted to work with I did – Smog. Bill Callahan to me, and I know people throw the word genius around, but to me he is a little bit of a genius. I think he really is unique in his perception of people and situations and is so good at putting it to music. It’s really hard to write a song that is heartbreaking and wry at the same time. I would have liked to have worked with Elliot Smith, I love him. VP: You opened for Bob Dylan in …and you must get asked this a lot so please accept my apologies, but really, what was he like? Did you have a good old chat? SARABETH: He was what you would want Bob Dylan to be. Funny, devilish, and totally charming, he had twinkly eyes. We talked for a bit, it was pretty unbelievable, I felt like I had been shot out of a cannon into outer space after taking to him, I didn’t know even know where I was. I recorded the conversation from memory into my phone that night so I would never forget anything he said. He is a sprite I love him…I could go on and on. Oh, and I kissed him, that’s my new song…’I Kissed Bob Dylan and I Liked It’…take that Katy Perry. VP: In 2009 You appeared on ‘Perfect As Cats’,a Cure tribute and produced a suitably sinister, atmospheric cover of one of my fave Cure tracks ‘Three Imaginary Boys’. How did you become involved in the project and what drew you to that track in particular? SARABETH: I think Manimal (the label) knew about me from DIG or the Smog record, I can’t remember. That was fun to record and I was happy I got to pick my song, I always loved that song. SARABETH: Oh no, I can’t do that. I’m calling my mom ….and she says…. introspective, redemptive, honest, heartbreaking and joyful. Thanks mom and thank you, Von Pip, for all your support. ‘Something For You’ By Sarabeth Tucek. ‘Blowing Kisses‘ By Sarabeth Tucek. ‘The Ex-Ex’ – ExLovers Interview. Love the song, will be buying the album. a 10/10 wow! I’m gonna “get well soon” instead. Thank you, glad you enjoyed both. I certainly hope Sarabeth get’s a lot more recognition due to this album.